Fishing on Red Lake is a blast in the summer time. Red Lake is home of the annual Red Lake Walleye Fishing Derby. 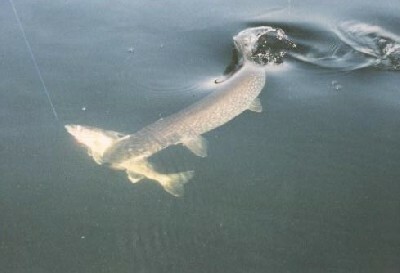 Check out this Northern Pike caught near Cochenour Cabin. Red Lake Also Has Walleye and Lake Trout fishing. There are lots of great spots available near Cochenour Point in Bruce Channel. You can fish right off of shore or the dock. We also have a 16' boat with seats and 15hp Honda motor available for rent. Contact us for more information.